First, let me say up front that I personally use Essential oils and I believe that the oils in and of themselves are NOT a bad thing and I believe the plants/herbs/flowers they are extracted from were created by the one true Creator of all things. But as followers of Messiah we MUST use discernment and recognize when elements of other religions/beliefs, in this case New Age/Witchcraft aspects are flowing through the companies and products we sell, support and use. I know one of the biggest things that trips us up is that Young Living claims to be a ‘Christian’ company, but friends I am not sure how one reading the literature and descriptions of the individual oils cannot see the New Age slant coming through. It seems this is becoming even more prevalent as more Christians align themselves with this Multi-Level Marketing Company. The founder of Young Living, Gary Young can be quoted in articles as using pagan and new age terminology and thoughts such as opening our Pineal gland or ‘Third eye’ which is purely pagan and dangerous, nothing Christian about it. The description given to the oils claims they are able to do things of a spiritual nature. -Uses Witchcraft wording to describe their oils. -Just an example: Young Living’s oil “Transformation” encourages you to make changes to your belief system by replacing negative beliefs with revitalizing new thought patterns. This is new age jargon and not the same as the Holy Scriptures teach us to renew our mind. -The five basic elements Young Living promotes as you use their Essential Oils are taken directly from witchcraft. Earth, water, fire, air and ether (spirit). I strongly encourage you to please read the links below to learn more – this is just a VERY SMALL sample of the new age ideas, terminology and thoughts that run through and through Young Living Oils. You may also be thinking, ok…but I am not using it for those reasons. Well, maybe you’re not and maybe you just believe in the actual medicinal properties so many of the oils have, such as I do. But the fact is, why would Christians align themselves with a company that is clearly promoting new age practices through their products? We really have no idea what type of mantras or ‘prayers’ may be going on within the distribution center(s) before the oils are dispersed to the distributors and then to your customers. 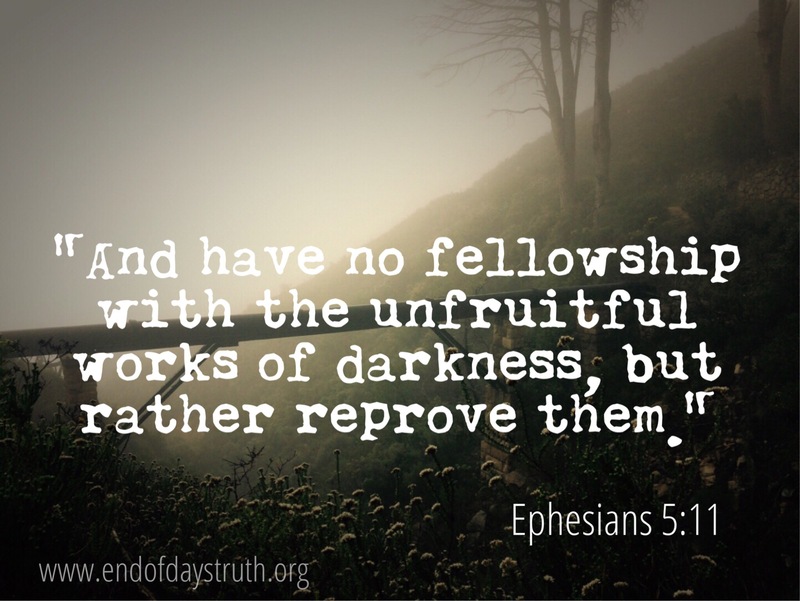 “And have no fellowship with the unfruitful works of darkness, but rather reprove them.” Ephesians‬ ‭5:11‬. “Abstain from all appearance of evil.”1 Thessalonians‬ ‭5:22‬. And multiple verses regarding the dangers of sorcery and divination (magical powers, witchcraft). Friends, this has been on my heart for quite some time and today I feel prompted by the Holy Spirit to share what I have learned and continue to learn in love for those that I know truly love and follow Elohim (God). As Christian’s we are accepting more and more ideas, thoughts and ways of the evil ones into what is being promoted as being ‘Christian’. We are not using discernment and we are not saying NO to these things as Messiah has instructed us to. This post does not even touch on the Multi-level marketing concept which I feel is a whole other issue. You may ask what EO Company I use and I have to say until now it has been Eden Gardens. I promoted them and have close to 80 of their oils myself. But, in my revisiting of this information I am posting here I took a closer look at their descriptions and although not as clearly blatant as Young Living, I am beginning to see some thoughts/wording that has caused concern for me. I will begin my search for a genuinely Christian company that produces quality EO’s to be used as Elohim intended (they are out there). For the actual healing/medicinal properties they possess and not for any spiritual purposes that only can be accomplished in us through our Messiah and the Holy Spirit Himself. Please research these links (there are dozens more) & dig deeper. Pray and ask Yahuah (God) to show you truth in this area. Have you found a legit eo brand yet? Thank you for taking the time to read this post and for asking. I’ve actually been looking into a company called Hopewell Oils (http://hopewelloils.com). They are a small, Christian, family owned company in Texas. They are simple in their mission and you can see by their website they are simply offering what God has shown them to be the goodness of natural things and essential oils that were created by Him. I actually wrote directly to the owner with my concerns and was very open about my position on these other MLM companies. She graciously responded and was very transparent about their beliefs and even shared they had concerns about the other MLM companies for the same reasons I expressed here and in my email to her. It was for those reasons they never got involved with the other companies, but started their own journey to creating quality Eo’s. She told me they do not even publicly advertise and rely on The Father to send them those that He leads to their company, they do not do it for the income as they have a farm and other small business’s they own, they simply want to share what they have learned. They make no claims of any spiritual effects from the oils and not even that the oils themselves will heal as she makes clear they believe all healing comes directly from Elohim (God). They probably do not have as many oils and blends as YL or maybe even Eden Gardens, but just from looking around they have more than enough and carry all of the oils I like to always have on hand. As well as many blends I have not even found elsewhere. I’ll be ordering from them soon, but from what I’ve seen and heard and simply through praying for The Father to lead me to the right company, I believe it’s been confirmed to me this is the one. I’ll be writing more about them in part 2 of this post. Notice it reads the works of the flesh. Grieving the Holy Spirit has to do with the works you do, not the company that the use to get your supplies. One of the works witches do when they practice witchcraft, is to infuse only pure natural essential oils for the purpose of healing, spell casting or emotional centering, balancing and grounding. What you are doing when you use essential oils is the same works the witches do when they practice witchcraft. Your intention is irrelevant for the word of God states that it is the works that are done, not the intention behind those works. And Galatians 5 was written to Christians. You are doing what the witches do when they practice witchcraft and it grieves the Holy Spirit. I am not trying to be harsh or mean. Hey, what is your story that you experienced? Yes, I would like to hear your “crazy” experience. I bought the kit and as soon as I read the literature, I shared the info with my husband. We promptly threw it away. I can’t tell you how grieved I am to see so many of my friends who profess Christ be absorbed into this cult. Things like spaying yourself and others with “harmony”and the like because you don’t get along. The only solution… read your Bible so that you too won’t be deceived.